NCREDIBLE RECENT PRICE REDUCTION - BELOW MARKET VALUE! 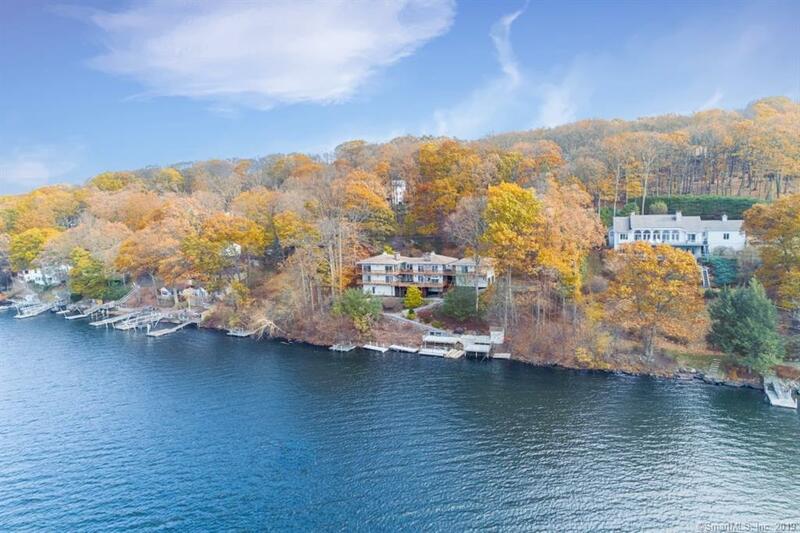 Ultimate privacy, western exposure & dramatic lake sunsets can be yours in this spectacular waterfront contemporary w/many recent updates including RENOVATED BATHROOMS & BEDROOMS; Buderus high-efficiency furnace, refinished floors and RENOVATED GUEST COTTAGE. Main house has a stunning open plan with walls of windows for an unencumbered view of CT Bear Mountain State Park. Chef's kitchen w/stone fireplace showcases a Wolf Commercial Range, peninsular bar, Caesar stone counters, butler's pantry & wet bar. The adjacent great room also offers high ceilings, pegged hardwood floors, stone fireplace & walls of windows. Spacious, private master suite boasts 2 walk-in closets w/built-ins, stone fireplace & NEWLY UPDATED bathroom with whirlpool and double sinks. Three additional guest bedrooms plus 2.5 more baths complete the main house plan. Separate GUEST COTTAGE w/great room, NEW kitchen, NEW bath & 5th bedroom. Sliders to multi-level, wraparound decks offer an abundance of outdoor living. Additional finished space on the lower level offers a game/exercise room. Large lakeside terrace, OUTDOOR KITCHEN with refrigerator and ice maker, NEW SPA & U-shaped dock. 125 FEET LAKEFRONT on 1+ acre cul-de-sac with designer stone walkways, professionally landscaped, lighted gardens offer spectacular outdoor entertaining spaces. Central air, heated 2 car garage, paved driveway & 2 additional paved parking areas. Available turnkey. Directions: Great Pain Road To Flint Ridge Be A Right To Second House On Driveway.